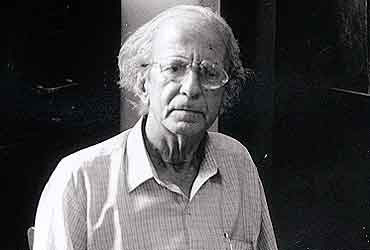 Nissim Ezekiel (1924-2004), the famous Indian-'Jew" poet, though one wonders if one should write so. Do we write Indian-Hindu poet, Indian-Muslim poet and so on and so forth. But I find this being mentioned at lot of places. Perhaps one needs to read this absolutely fabulous poem of Nissim Ezekiel, arguably the 'father' of modern India-English poetry (will they take the tag back someday? ), wherein he explores his Indianness through various images that confront him with his own minor place among the minorities in India. Surely, in the context of Nissim Ezekiel, his placement as an Indian-English writer, a kind of a linguistic minority in Indian literature despite the English langauge being a tool of the powerful in India, has its own dynamics. But what the poem hits at, and this has been one of the influential poems for me to understand and explore one's own position in the time and space that one inhabits, is how the backwardness of one's society, or country is part and parcel of one's own self and identity, and how willy-nilly, both impinge upon each other. 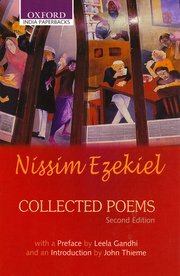 The poem is also supposed to express the inherent motive of Nissim Ezekiel finally coming back to India from England, and start the complex life of an intellectual in India focussed on finding some space for Indian-English writings, especially, poetry. Or sleep, a boy of meager bone. His borrowed top refused to spin. A mugging Jew among the wolves. That year I won the scripture prize. A Muslim sportsman boxed my ears. One noisy day I used a knife. Were said. My morals had declined. I heard of Yoga and of Zen. Could 1, perhaps, be rabbi saint? Twenty two: time to go abroad. Companions shared my basement room. The London seasons passed me by. In everything, a bitter thought. And learned to laugh again at home. How to feel it home, was the point. Knocked at the door like the Devil. They hawked and spat. They sprawled around. Changed jobs, and saw myself a fool. I knew that all was yet to sing. (The hooded bullock made his rounds). A Major bearing British arms. Fierce men had bound my feet and hands. The later dreams were all of words. That grip on things the worldly prize. I would not suffer that again. The inner and the outer storms.